It has truly been a very eventful few days. My foal and I are adjusting beautifully to our life together. He is quite smart, inquisitive, and charming ….if I say so myself. (Blush, Blush) I’m hearing others making these same statements about him…so I guess you could say I am in complete agreement with them! Weather permitting, we spend time outdoors in the paddock together….and then we return to the barn for our evening’s rest. I am pleased to report that he is doing everything perfectly…just as a MOM would hope for a foal who is only a few days old. I must say, I am having the most fabulous time being a MOM and just watching him…sleep, eat, play, and snuggle up to ME. It is an absolute JOY….and I could not be happier. Just as with human babies, there is paperwork to be completed upon the birth of a foal. All of the proper information must be submitted to the Jockey Club for his JOCKEY CLUB PAPERS to be issued. These papers are a thoroughbred’s version of a human’s BIRTH CERTIFICATE. Martha at Lane’s End is preparing his LIVE FOAL report this morning. Later after this information is processed, blood work will be provided and this will be used to properly verify he is definitely MY FOAL SIRED BY BERNARDINI. I.D. photos will be taken and submitted to the Horse Identification Department noting every single aspect of his body…color, white star, any other white hairs, or markings. All of these details are noted in a very explicit format. Such steps are completed with each foal that is born. ALL thoroughbreds are specifically identified and parentage qualified with the goal of keeping the integrity of our sport always operating at the highest levels. You may remember my HORSE IDENTIFICATION PHOTO. I found it again for you. I was just a few months old at the time it was taken. Who ever thought it would be so much FUN to look at several years later. Hmmmm! What do you think? Does he take after ME? When all of these requirements are completed and verified, the Jockey Club will formally issue his CERTIFICATE OF FOAL REGISTRATION. This will follow my adorable little guy, just as a birth certificate does a human, throughout his life…when he races, travels, or whatever else he may do! I also want to tell you that I checked in on TASTY this morning. She is ‘happily in foal’…and from all indications it appears she still has a few days to wait before she gives birth! I’m wishing her all the best! While he’s napping, I think I’ll send her a few ‘foaling pointers’….now that I’m such a PRO and have a bit of experience in this area! I just got the memo and the date is all set! SANTA ANITA is having LOS ANGELES’ LARGEST BABY SHOWER FOR ME and MY BABY this Saturday. How special is this! The life-size painting of ME, THE QUEEN’S DANCE, which we unveiled during My Breeders’ Cup Party last year at Churchill Downs, is going to be on display. Jaime Corum, the artist who created the piece, and some members of my TEAM, will also be there to visit with fans. The beautiful part of this is that MY SHOWER will honor some of the charities I have worked with during my career! My BABY and I are so fortunate, thus, it is truly my privilege to assist others who may need some help whenever I can! I’m beginning to realize the ‘teaching part’ of being a MOM starts the minute the baby is born! Thank you for helping ME to illustrate to him the ‘gift of giving to others…comes in so many ways’. Your foal’s head, ears, and star resemble your dam, Vertigineux. And I am sure his heart is and will be as large as yours and his sire’s are Be healthy, safe, and happy. When I think of your baby, I remember a horse in Jane Smiley’s beautiful novel about horse racing (Horse Heaven). The name was “Limitless” and I do not know if there any legalities about using that name (or if if has already been registered), but I suggest that name for you along with “Mondata” (Zenyatta Mondatta ala Sting). But there is lots of time for that. You and your baby are surrounded with love from around the world! The colt has Zen’s frame, ears, and disposition………..bet he has her racing talent, too! 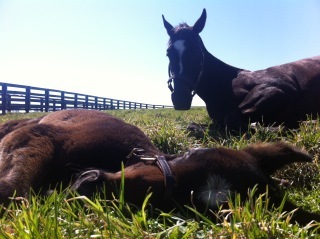 Hey Zenyatta, not only are you doing great as a new Mom, you are a very smart new Mom! I notice when your baby lies down to rest, you do too! I’m sure you find taking care of a newborn very hard work and it is good that you do this. It will keep you from getting too run down and your milk from getting “thin”. When my kids were little babies , I used their naptimes to do house work and fold laundry and I was always pooped. Good for you Queen Z! Your foal is SSSSSSOOOOOOO cute! I think he does take after you- but you make him look sooooo tiny with your awesome height! I cannot wait to hear whay you have named him. oh!! Zeny tou dont know how much i LUV! u and your prince:):) You both bring me so much joy!! Your always in my prayers! FROM YOUR BIGGEST FAN AMY.